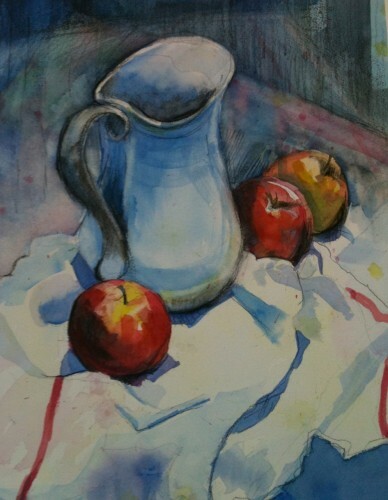 My challenge to convey whites in watercolour in Barry’s Tuesday watercolour class was to maintain the relationship between core and cast shadows, while developing the shapes of the white containers in contrast to the brightly coloured apples. As we observed, when bathed in direct light, some of the apples were lighter than the adjacent white objects. 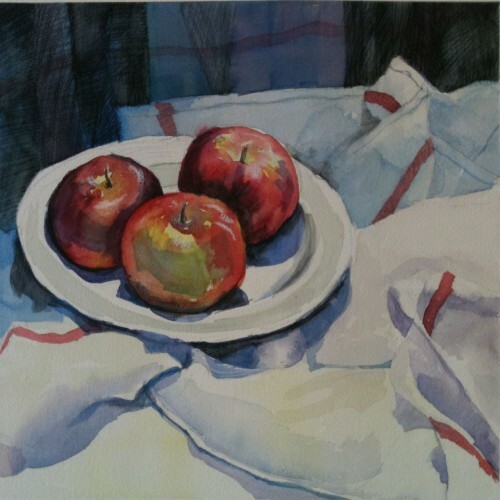 Later in the week I re-visited the exercise, using red apples, white objects and a white cloth trimmed with a red stripe. I randomly touched very pale pink, yellow and blue into the bright fabric area before I drew in the shadows. It’s virtually invisible, but does help the white cloth glow. Once again I finished up with soft charcoal pencil. I joined a Sustained Saturday watercolour class taught by my partner Barry Coombs for the afternoon, after a space opened up at the last minute. These studio days run from 10 a.m. until 4:30 p.m. several times each term. 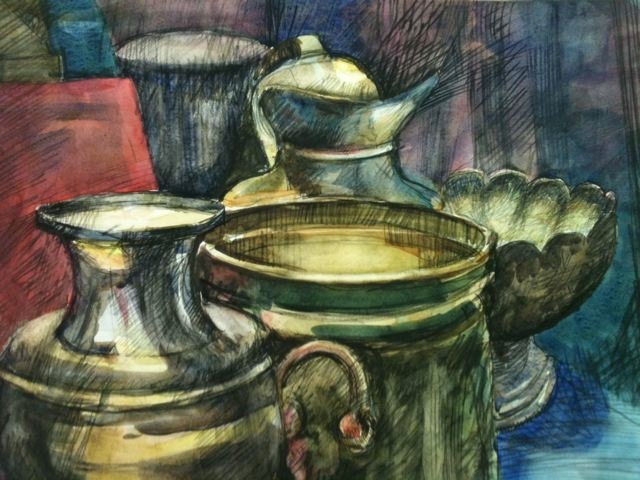 The still life subject was predominantly brass and we were encouraged to compose our image by employing a very tight crop. I admire people who work in watercolour, and even though I’ve been working at it for about 18 months, my results are very unpredictable. That’s partly what makes it fun – and terrifying! My original idea was to spend the afternoon drawing in black and white with pen and ink. Working on hot press paper, I sketched the subject lightly with pencil. Then, inspired by the work being done by others around me, I changed my mind and used watercolour to block in the key shapes, adding some secondary washes to form the shine and shadows. Next, returning to my comfort zone, I added value, structure and depth with charcoal pencil. (So much for planning!) I was surprised by how the charcoal seemed to melt when it touched the still-wet paper as I worked. I liked the effect, and for a while worked back and forth between the dry and wet mediums. If you want to see more about the class, see Barry’s blog post about the day. Watercolour and Charcoal Pencil study 12" x 16"